On 21st April General von Falkenhayn met with the German 4th Army commander, Duke Albrecht, at the Army headquarters in Tielt. The purpose of the meeting was that General von Falkenhayn wanted to press Duke Albrecht to carry out the gas trial in an attack as soon as possible. 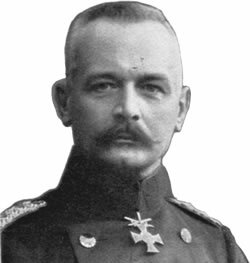 In the light of General von Falkenhayn's aims for the attack on the Ypres battle front, that is, to test the new weapon as soon as possible and to cloak the preparations for his planned attack on the Russian front, he insisted that the 4th Army should not to give itself too great an objective for this attack. It must, he insisted, make the attack at the earliest opportunity. As a result of favourable weather reports from the meteorologists attached to the special pioneer units, the order to carry out the attack was subsequently given by Duke Albrecht for the next day, Thursday 22nd April. The gas was to be released in the early hours of the morning at 05.45am (British time).